Control Center gets a complete redesign, for the better. iOS 11's Control Center in action. In iOS 10, Control Center was a three-page set of quick-access controls that you could summon with the flip of a finger from the bottom of the screen. In iOS 11, it’s been condensed back into a single view. While that view is indisputably much more densely packed than the old version, I’d argue that the removal of confusion about which page of Control Center you’re viewing—and frustration when you just wanted to turn on the flashlight but then realized you were on the audio control screen—makes it worth it. The gesture remains the same, too—unless you’re using an iPad or an iPhone X. On the iPhone X, to summon Control Center you’ll need to pull down from the top right corner of the screen, which can be awkward if you’re using the phone one-handed. (Apple has placed some key items, such as flashlight camera buttons, on the lock screen of the iPhone X.) For iPad users, Control Center now lives alongside the multitasking switcher and has repurposed the basic flick-up-from-bottom gesture for displaying the Dock, so you’ll need to swipe all the way from the bottom of the screen to the top to make Control Center emerge. Control Center’s interface is now a series of rounded-rectangle controls. The smaller ones let you control basic functions, like flashlight mode. Two tall controls are sliders to let you adjust brightness and volume by placing your finger on them and sliding up or down. Two large blocks at the top of Control Center let you control audio and wireless settings. Many Control Center items, including the audio control, generate pop-up interfaces. When I first saw the new Control Center, I was frustrated with the demotion of audio controls—which I use all the time—from a full page to a single icon. But Apple’s design is excellent: You can tap on the play/pause, next, and previous buttons within the audio control. There’s also a speaker icon in the upper-right corner of the audio control, and if you tap you can quickly choose your audio output device. Similarly, the wireless control block is more sophisticated than it can appear. From the main Control Center screen, you can toggle Airplane Mode, Cellular Data, Wi-Fi, and Bluetooth. But if you 3D Touch (or tap and hold on non-3D Touch devices), you’ll get extra options to control AirDrop and Personal Hotspot. 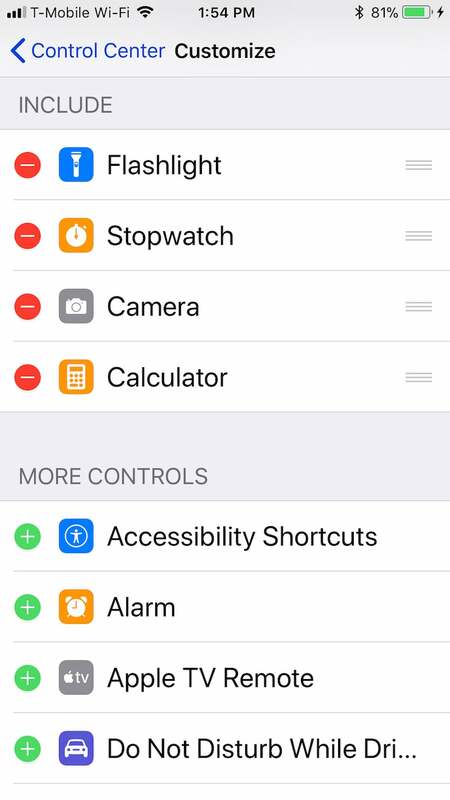 By default, Control Center shows wireless, audio, brightness, AirPlay screen mirroring, and volume controls, plus buttons for flashlight, timer, calculator, and camera. But 18 different items are customizable in Control Center, including Low Power Mode, Do Not Disturb While Driving, Screen recording, Wallet, Accessibility, the Apple TV Remote, and Notes. Customize Control Center in Settings > Control Center. To customize Control Center, tap on the Settings app, then scroll down a bit and tap Control Center. Many of the Control Center items offer extra features via 3D Touch or touch-and-hold. If you 3D Touch on the flashlight icon, you’ll be presented with a slider to adjust its brightness. The Timer will let you quickly set a timer of a specific duration without needing to switch to the Clock app. And if you’re a HomeKit user, don’t worry—with one tap on the Home icon, you’ll be presented with all of your devices and scenes. It will take time to get used to Control Center in iOS 11. But in the end, it’s a strong redesign—amplified by the added ability to customize Control Center by choosing from 18 different widgets. That wall of rounded rectangles may seem unfamiliar at first, but over time you’ll come to view it as a friendly, helpful place.